LANGUAGES are doors to culture. And the two are inexorably intertwined. A language becomes effectively comprehensible only through lessons on the culture of a particular language and its users. The language, learnt by children, gives them not only a tool to communicate, but a culture to enjoy throughout life, said Vandana Marwaha, Principal, Delhi Private School (DPS), Sharjah. 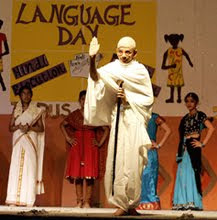 The DPS marked the 10th edition of the Language Day on Wednesday. "We inspire our students to grab values of tradition through lessons of languages and the concept is converted into the Language Day celebration," she remarked. 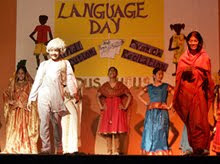 The celebration is highly creative as it highlights the wide reach of languages to different cultures. The principal said, "Our institution in Sharjah has always been in the forefront of promoting cultures among our students through languages." Sahar Mohammed El Shenawi, Coordinator of French Department, said, "The annual day celebrations focus on three languages - Arabic, French and Hindi - organised for the students of the middle school with a fantastic range of competitions, festivities and exhibitions." "The celebration elevated the language studies to a totally different level of in-depth lessons on the life of societies, traditions, culinary cultures, art, literature and music," Sahar added. "The French students took part in an inter-house poetry recitation competition. Grade-6 students performed a fancy dress show. Monuments, charts, on France were put on display," said Uma Krishna, Head, French Department. "There was a mouth-watering mango festival. The participants prepared popular French items," she added. Huda Aziz Soghayroon, Head, Arabic Department, said, "Our girls exhibited Egyptian monuments like pyramids and mummies and also prepared Egyptian food." "Emirati dance genre "Al Yolah" was also performed by 25 boys of the department," added Amani Farooq, coordinator of the department. Kamna Katoch, Head, Hindi department, said, "Hindi students took part in an elocution competition and in a fashion show by 25 candidates depicting costumes from all Indian states." "Experts from other schools have been invited as judges for the contests, and the winners have been presented with merit certificates," she added. "With the success of the programme, we are planning to organise a UAE inter-school event from next year," said the principal.